When we bought our new house last July, I looked up at our massive backyard bur oak and longed for spring. I hoped that the tree would drip with warblers one day. The gnarly old landmark of our street has that presence about it that I speculated would pull in migrating birds from miles around. At least, that is what I hoped and dreamed, on a hot, decidedly unbirdy Saturday in mid-summer. We're on the backside of spring now, and the old bur oak did not disappoint. This past weekend, it was full of yellow-rumped warblers, affectionately known as "butter butts"- perhaps half a dozen at a time, foraging for insects amongst the young leaves and the long, stringy catkins of oak flowers. Don't see the yellow patch on the bottom? Well, that's because it is actually on the back of the bird, which you can't see when your craning your neck straight up. 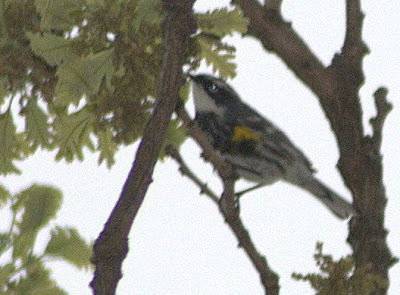 Here's a shot of a yellow rumped warbler from Sanibel Island that I captured in March, 2008, where you can barely see the yellow patch just below the tip of this bird's right wing. 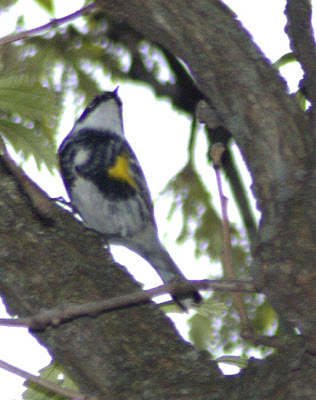 Yellow-rumped warblers, along with a slew of other interesting species, are passing through Ohio right now. In fact, the major wave of colorful birds has probably already subsided. I was glad that I was able to give a few individuals respite in our backyard. I haven't seen any additional butter butts here along the river since a few days after I did that posting on yellow-rumps. That Sanibel shot if\s really great. I love that name...Butter Butts. What a beautiful bird. 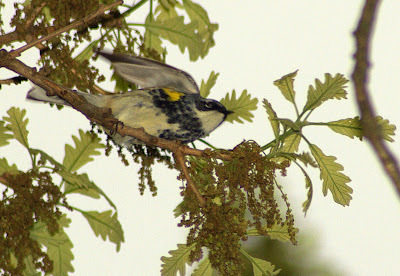 I wish my oak tree would draw some warblers. What great pictures! The pic from beneath the bird looking up is fantastic, what a great perspective and composition rocks too! Great work Tom. We need to get you some climbing gear so you can get up there with them! ...you're lucky to have such a big, wonderful tree in your yard. I have to be content to drive about 5 minutes to the Little Miami Bike Trail to see warblers. Wonderful photos...especially the Sanibel shot. Mine our gone too. Only a few days, but it was nice to have them for sure. 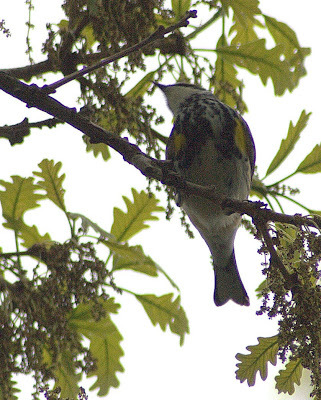 Mary- I bet you get warblers, its a little late probably, but keep looking high up in the trees, especially out towards the ends of the branches. Thanks Chris- In retrospect, I'm thinking I should have only posted the first and last picture. Those other ones have just a wee little too much chromatic aberation. Thanks Kelly- I took the Sanbiel shot with a rental lens, I wish I had my own copy, the Canon 400 5.6L is sharp as a tack with bokeh smooth as butter. What a beautiful bird. I have never saw one in my area in the hills. I see I was wrong on the baby guess. Thought for sure it would be a boy. Congats on the beautiful daughter. ...renting a lens sounds like a good idea. I just have a 70-200mm with a 2x tc, but having a 400mm on vacation would be really nice! 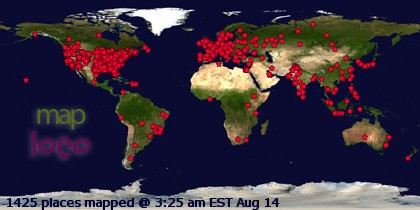 Thanks Everyone- I'm still alive just very busy traveling around the state. Ha! Butter Butts! I love a name that tells you what it is. Good luck on your travels and adventures! Beautiful images Tom, I am heading to South Florida very soon, I don't have the right lens for birds and I know most have moved out, but still hope to find some interesting subjects ! !